As part of our exploration into alternatives to an extractive forest economy, I had been opening up to get inspiration on how I could start generating some income on the land to support our work here. I had already been playing with herbal products, and it was always an intention and a joy to work with wild herbs. 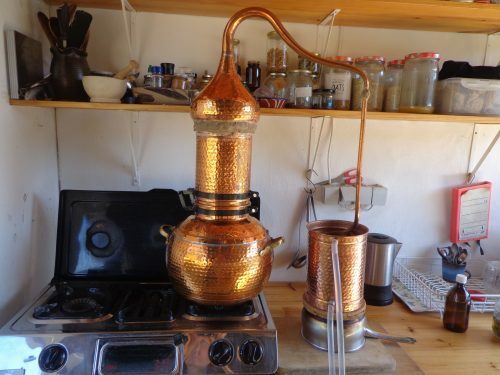 I had been harvesting wild oregano and selling it on a small scale, and had begun experimenting with distilling hydrosols from wild aromatic plants in a copper alambique. When the idea popped into my mind to start making essences it made perfect sense – I got the whole packet of energy and information downloaded to me in one night, and it felt right and very exciting. As a lover of trees since I can remember, this download felt like an amazing opportunity to develop my interspecies communication with the trees all around me. As I continued to listen over the coming day or two, I felt the trees offering their services for healing, and began to feel their different energies and messages begin to emerge more clearly. I was to make a range of essences only from the flowers of trees, not other kinds of plants. These trees were to be from Monte da Vida – this particular 34 hectare area of land. There would be a direct relationship via the essences from these particular trees and the people who used the essences, a relationship of mutual benefit as profits would be returned to the project to fund the work on forest regeneration, building soil and biodiversity. The healing journey of the person, and the healing journey of the land would become linked. 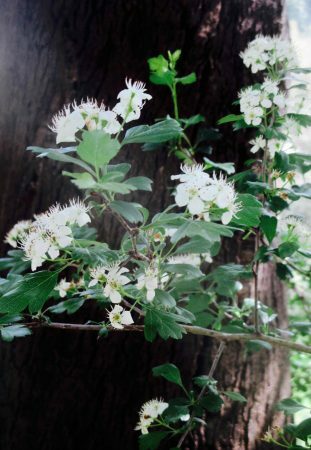 A few months later in the spring, I made the first essence – Hawthorn – and found it to be a beautiful and deeply moving practise. 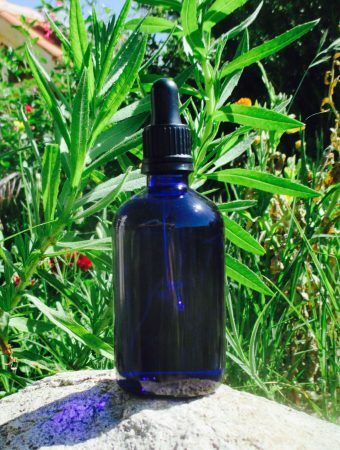 The best known vibrational essences are the Bach Flower Remedies, and it is the ‘Sun method’ set out by Richard Bach that I used to make my essences. Flowers are carefully cut, without touching them, and dropped into a small glass vessel filled with spring water. The vessel is then set in full sun for several hours, on a clear cloudless day. Meanwhile the essence maker sits at some distance to not interfere with the process, but to keep watch and make sure no shadow falls on the vessel, and no interrruption occurs. 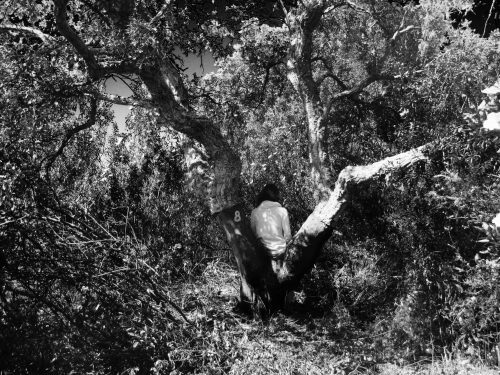 For me this is a time to meditate with the tree, and open up to receive any communication. As I made the first essence and waited for the Hawthorn blossoms to leave their imprint in the water, I also felt the waters of my body being infused with the spirit of the tree, and received more information about this remedy and its use, which included also vague memories/sensings of the ethnobotanical history of this tree, its uses by human cultures within Europe for medicine, ceremony and celebration. Hawthorn was followed by Cork oak, Holm Oak and Sweet Chestnut. 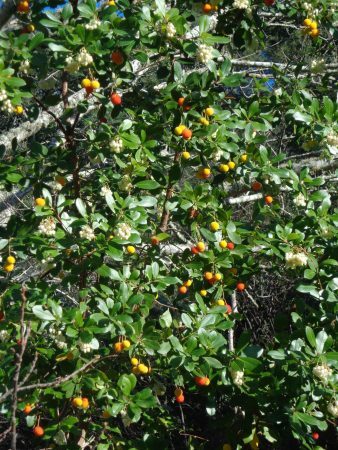 And a few days a go on the winter solstice, I made an essence from one of my favourite trees, the Medronheiro (Strawberry tree), that lights up the shadiest corners of the forest through the winter with its brightly coloured fruits and its delicate clusters of white bell-shaped flowers. So I now have 5 essences, and I intend to make Wild Olive and Eucalyptus to bring the range to seven. Soon I will have profiles of all these trees and the process of making them up on the website. I also continued experimenting with the distillation of hydrosols, and was excited to try and capture the delicious smell and the energy here after the rain drenches the parched land at the end of summer. As a result, I formulated an Essence Hydrosol spray called Rain, a combination of five different aromatic waters, with a few drops of the two Oak Essences. This spray brings fresh cleansing and grounding energy, and a scent of mediterranean wildness into the airport, or the city during rush hour. We are living in challenging times, but for many these challenges are catalysing an awakening awareness of our place in the world, and the realisation that we are not separate. The good news is that the rest of nature wants to support us. As we open up to the connection, recognise our place in nature, align ourselves with natural laws, and offer our energies, technologies, minds and hearts towards the restoration of the planet to one of balance and abundance, the rest of nature in return offers us so much support. My wish is that these essences will help to open up a direct link between the person taking them and the tree (or trees) that they were made from. Connecting with the trees, and linking into their woodland community can help maintain equilibrium amidst rapid change and chaos, as well as each having their specific qualities that can support emotional, mental and spiritual wellbeing. The essences come from the place where I wake up most mornings, from trees that I know and live with. I feel the support of the land even when I am away, and the essences are one way that others can benefit from this grounding support as well. As our own culture has degraded and lost connection, so too have many ecosystems. There are few places on the planet with intact and complete ecosystems at their full expression. Regenerating the land and regenerating ourselves are deeply interlinked. 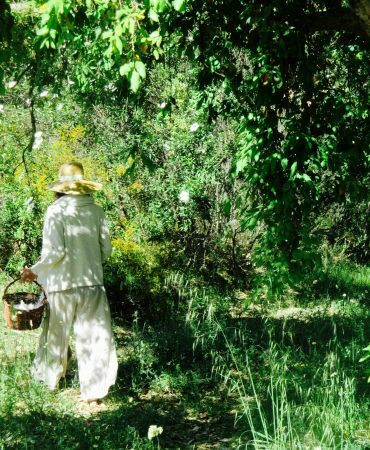 The land at Monte da Vida is in a healing process, like those of us living here, and those who will take the essences. My vision is for a symbiotic community of mutual care and connection that also links us into the broader context of planetary healing. The Forest Alchemy range will be launched in the spring of 2019. They will be the first range of products sold via a new company I have set up called Earthlife Goods, which will sell products from grassroots forest regeneration projects. We are building a network of “forest allies” who will sell the products, or they will be available directly from me. If you would like to do a two week trial with one of the essences and provide me with feedback, I can send you one for a small cost. Contact me for more details or write a comment. This sounds wonderful Clare. I would be happy to try one of the essences for a small cost and give you feedback. Thanks Jane I will email you the details. I love seeing your adventures in the forest too! Hi Monika, nice to hear from you! I will email you with details of the essences. Love to you.